Hi, my name is SJ and I am newly addicted to pink hair. For a few years now I’ve admired pink haired ladies from afar and thought to myself ‘ooooh I’d love to do that’. But for one reason or another, mainly because I’ve always been too scared, I’ve never succumbed. However, with more and more temporary or wash out colours to choose from I thought, why not give it a go? 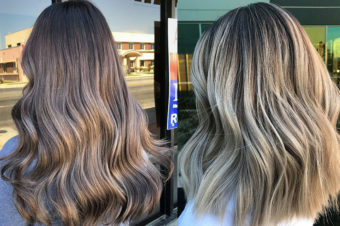 If I hate it – I’ll frantically wash my hair a few times and it’ll be gone. So that’s what I did. My pink haired weapon of choice? 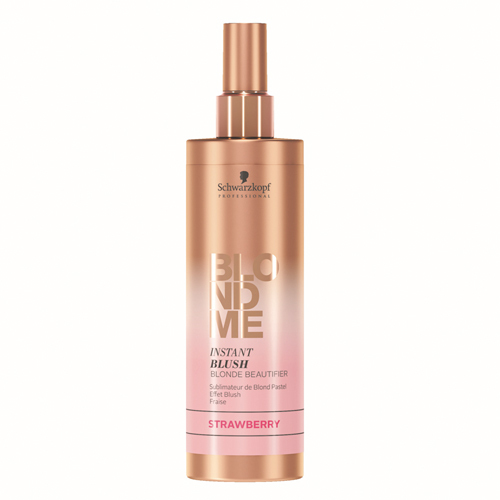 Schwarzkopf Professional BlondMe Instant Blush in Strawberry, £16.75. 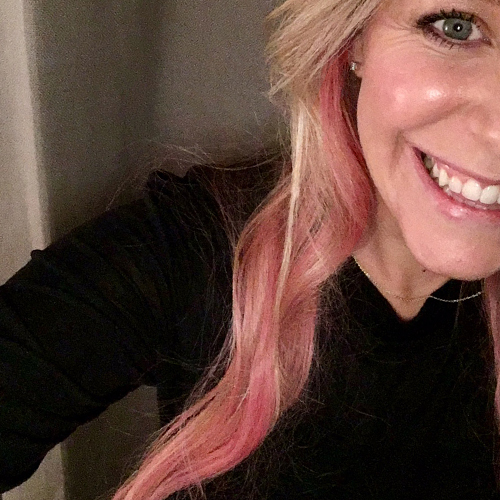 I was lucky enough to be given a demo by two Schwarzkopf colouring pro’s – more on that to come – to show me exactly how to get the best out of my blushed tresses but what I found when using it at home was three different application methods delivered slightly differing effects, all deliciously pink and gorgeous. 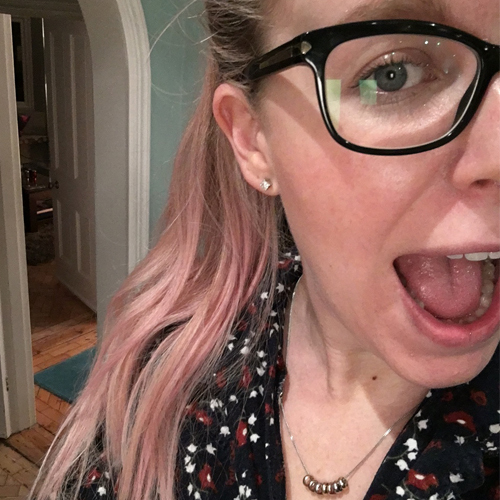 I have confined my pink haired journey to the bottom half of my hair (told you I wasn’t brave) but mainly because I found that easier to do on myself. 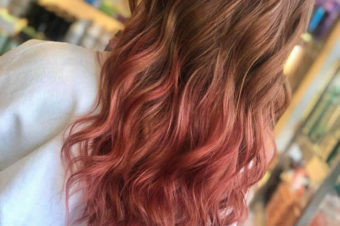 For this, I shampooed and conditioned my hair, sprayed the colour on wet hair (this can be a bit messy, so I’d advise you stay in the shower and do it). Then I blow-dried and before my hair was bone dry, quickly spritzed a bit more of the colour on. Top tip at this stage: hold your hair into an old towel and spray onto that. Trust me, your carpets will thank you for it. Then I finished blow-drying and fell promptly in love with my hair. The colour lasted about three washes and as I only wash my hair every three to four days, that was a few weeks of feeling like a rockstar. Finally, a touch of pink. This is the least messy and most subtle of looks. I simply unscrew the lid of the Instant Blush, poured some of the colour into a plastic bowl, added in a dollop of any conditioning mask I could find and then slathered it all over the ends of my hair. Got in the bath, relaxed for 15 minutes and rinsed off. This was so subtle that in some lights you could hardly see the pink effect so perhaps a good option for anyone who works in a conservative office or the best place for starting with pink if you’re a scaredy cat like me. 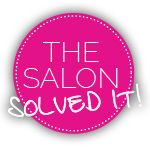 If it this still all sounds too much for you to deal with, ask your stylist to do it for you instead as the Instant Blushes are available in all Schwarzkopf salons. 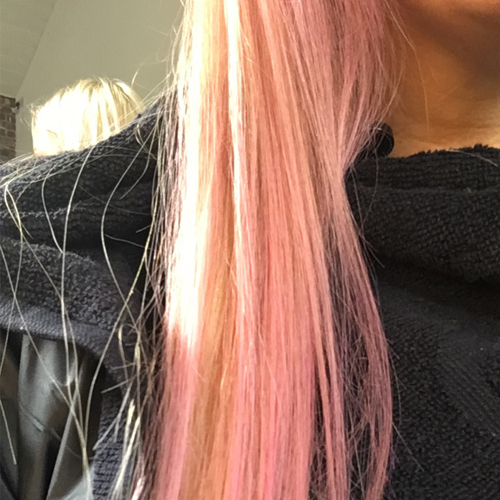 That’s how I began my pink haired journey, with the colour extraordinaires that are Tim Scott-Wright (founder of Tim Scott-Wright @ The Hair Surgery) and Gemma Hensman (from Hensmans) masterfully applying it and making my pink haired dream a reality. Watch the video below to see how they did it and just know that when my two year old daughter saw it, she told me I looked like her ultimate heroine, Pinkie Pie. In the life of a toddler, there is no higher accolade. Therefore, I’m never not having pink hair again. Gone on, you know you want it too. Want more pink? Click here!